Situated in the mountains, this hotel is within 9 mi (15 km) of Marienberg Church, Aqua Marien Water Park, and Church of Wolkenstein. Wolkenstein Castle is 9.1 mi (14.6 km) away. 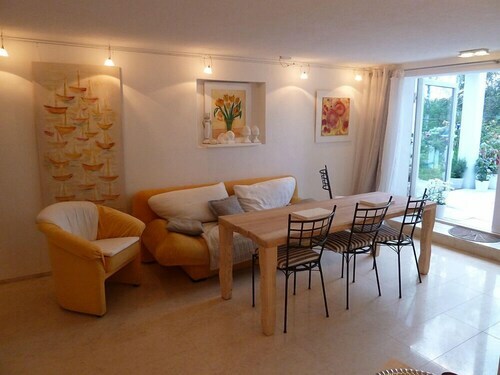 Situated in Marienberg, this apartment building is close to Marienberg Church and Aqua Marien Water Park. Regional attractions also include Church of Wolkenstein and Wolkenstein Castle. Situated in the mountains, this romantic resort is 3 mi (4.8 km) from Marienberg Church and within 9 mi (15 km) of Aqua Marien Water Park and Church of Wolkenstein. Wolkenstein Castle and Scharfenstein Castle are also within 12 mi (20 km). Located in the mountains, this Oberwiesenthal hotel offers ski-in/ski-out access within 1 mi (2 km) of Oberwiesenthal Summer Toboggan Track, Fichtelberg - Oberwiesenthal Ski Resort, and Fichtelberg Cable Car. Neklid Ski Area and Novako Ski Centre are also within 3 mi (5 km). Oberwiesenthal Station is 11 minutes by foot. How Much is a Hotel Room in Pobershau? Hotels in Pobershau start at $78 per night. Prices and availability subject to change. Additional terms may apply. Are you traveling in Ore Mountains and looking at booking an apartment or hotel around the hustle and bustle of Pobershau? You will find 3 accommodation options in Pobershau that ought to work for you. Travelocity-listed places to stay that are within a short distance of Pobershau include the Hotel Waldesruh and Landhotel Pockau. Investigate the Rathaushotels Oberwiesenthal as well as the Best Western Ahorn Hotel Oberwiesenthal - Adults Only. The Rathaushotels Oberwiesenthal is located 19 miles (30 kilometers) outside of central Pobershau. The Best Western Ahorn Hotel Oberwiesenthal - Adults Only, is located just 19 miles (30 kilometers) away. Another possibility is to check in to the AHORN Hotel Am Fichtelberg or the Traditionshotel Wilder Mann. The broader Saxony district is certainly worth having a look at too. Check out Saxony's ruins. Anyone with a love for the great outdoors should also leave time to check out the region's forests and rivers. Common activities in this particular area of Germany include snowboarding and skiing. Want more to do? Spend a few hours visiting Karl Marx Monument and Roter Turm Tower, which you'll find in Chemnitz, 19 miles (30 kilometers) to the northwest of Pobershau. Next time you visit Chemnitz, check out the TOP Günnewig Hotel Chemnitzer Hof and Hotel an der Oper. For another option, stay in Zwickau, 35 miles (53 kilometers) west of Pobershau, where you can choose between the Holiday Inn Zwickau and ACHAT Premium Zwickau. When you visit Zwickau, a couple of places to add to your itinerary are the Zwickau City Museum and Priest's House. If enjoying sport is what you love, take the time to visit Red Bull Arena, which can be found 60 miles (99 kilometers) to the northwest of Pobershau. For visitors who enjoy the idea of locating a room close to the game, reserve a room in the Steigenberger Grandhotel Handelshof Leipzig or Radisson Blu Hotel, Leipzig. Karlovy Vary International Airport can be found 35 miles (54 kilometers) away from Pobershau. Enlightened travelers who would like to find a hotel nearby can easily book a room via Travelocity at the Hotel Quisisana Palace or CARLSBAD PLAZA Medical Spa & Wellness hotel. Picked this place on line after looking at some really boring commercial style hotels that were available closer into the center of Chemnitz. Adjacent to a small village and a golf course. Not only is this a hotel, it is also a center for art, both physical and performance. 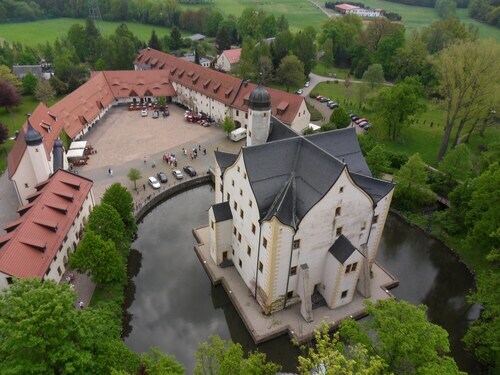 The hotel part wraps around a cobblestone courtyard overlooking a small castle surrounded by a moat. Additional outbuildings hold a silversmith, glass artist and other crafts persons. The rooms are spacious and well appointed. The food is outstanding! Breakfast was a full out German spread with meats, cheeses, breads, veggies, and lots of different quarks, jams and the like. Dinner was both outside on a terrace or inside in arched ceiling comfort. Good selection of standard German fare plus regional, fresh ingredients. Wish we could have stayed longer!